Goleby's Cottage07876 778580work Self-cateringCosy Golebys Cottage is tucked away on a quiet lane in the rural village of Hickling, within easy reach of the best Norfolk has to offer. Hickling boasts the biggest of Norfolk Broads, a nature reserve and the superb Greyhound pub is just 2 minutes walk from the cottage. One of the benefits of staying at Golebys cottage is it's location, as it is also just 3 miles from Norfolk's stunning golden beaches. The cottage is also a mere 5 miles from the famous Horsey beach seal colony. Historic Norwich, the seaside towns of Cromer and Great Yarmouth, plus the Norfolk Broads capital, Wroxham, are all within 35 minutes drive. The nearest supermarket is less than 10 minutes away, in Stalham. Cosy Golebys Cottage is tucked away on a quiet lane in the rural village of Hickling, within easy reach of the best Norfolk has to offer. Hickling boasts the biggest of Norfolk Broads, a nature reserve and the superb Greyhound pub is just 2 minutes walk from the cottage. One of the benefits of staying at Golebys cottage is it's location, as it is also just 3 miles from Norfolk's stunning golden beaches. 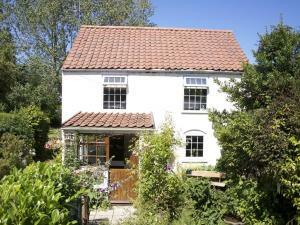 The cottage is also a mere 5 miles from the famous Horsey beach seal colony. Historic Norwich, the seaside towns of Cromer and Great Yarmouth, plus the Norfolk Broads capital, Wroxham, are all within 35 minutes drive. The nearest supermarket is less than 10 minutes away, in Stalham. Goleby's Cottage is extremely well equipped and a real home from home, perfect for couples, families or visitors with pets. For summer guests the cottage has a fully enclosed, secluded country garden, which is a riot of colour. The patio table and chairs are perfect for meals outside, or simply relaxing in the garden, and there is also a barbecue provided. Autumn and winter visitors can snuggle up to a real log burner and underfloor heating.